If you use washcloths to remove makeup, or clay masks, or sleeping packs, you probably know this struggle: Boy, do they get stained up! I know this struggle because I live this struggle; while I'm not much of a clay mask or sleeping pack gal, I do use a washcloth every night to remove my makeup — and we're talking a full face: concealer, blusher, bronzer, eye makeup, oh my god so much eye makeup, bright-pink lipstick ... you get the picture. Here's how to keep your washcloths looking brand new. The good thing about washcloths is that they're fairly inexpensive purchases. Which is not to encourage you to live a wasteful life, but just to point out that they're items you can think about replacing more frequently than you might replace bath towels. They can also be easily recycled for use as cleaning rags, or wiping dog paws after a rainy walk, or for leaving in the car to mop up spills when they inevitably happen. If you use washcloths to remove makeup or clay masks, it's a good idea to avoid white or light-colored washcloths and opt instead for darker colors like black, dark gray, or brown. Maroon, too, will hide a multitude of makeup stains, especially if you wear a lot of dark lipsticks. Over on the other end of the color spectrum, if you're a person who uses any kind of skincare products that contain benzoyl peroxide or other lightening agents, stick with white washcloths (and towels, and pillowcases!). Color loss is irreversible unless you overdye the fabrics, which, let's be honest, is a bit much to ask. If you prefer a thinner cloth, this pack of 10 spa-style washcloths is a great option. If makeup or mask residue does get on your washcloths, there are a few things you can do to ensure that the stains don't stick around even after washing. The first thing is going to sound obvious, but it really will make a huge difference: Rinse the washcloth well after use, holding especially stained sections taut under running water. The force of the running water will go further than you'd expect in flushing out leftover makeup or product. Stains that don't come out after flushing can be treated with OxiClean Max Force Laundry Stain Removal Spray, which is INCREDIBLE at removing makeup stains from textiles — and I speak from personal experience here! Then, come laundry day, be sure to use a good detergent, like Tide Ultra Stain Release. It's also a good idea to use a laundry booster (aka the category of laundry products that are used in addition to detergent). In the case of stained towels, powder detergent boosters like OxiClean or Borax are great choices. Over time, especially with white or light-colored washcloths, dinginess and staining will occur. 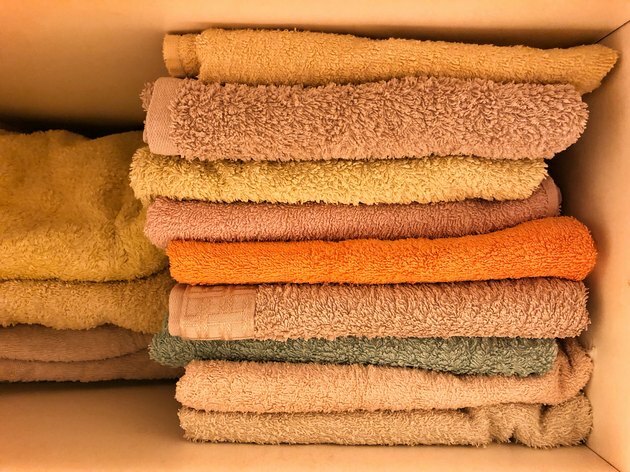 If you want to revive, rather than replace, a set of washcloths that have seen better days, soak them for several hours in a laundry booster prior to washing. OxiClean is the best option here, but Borax or even plain old Tide will also work well. Dissolve in enough hot water to fully submerge the washcloths and let them soak in that solution for at least an hour, up to overnight. Then launder as usual — you'll be amazed at the difference a hands-off soak can make in the appearance of your makeup removing towels!